A cannelé is a small French pastry with a soft and tender custard center and a dark, thick caramelized crust. They are made from eggs, sugar, milk and flour, flavored with rum and vanilla. The custard batter is baked in a fluted copper mold. Traditionally, the molds are greased with bees wax. This adds a hint of honey flavor, and some crispiness to the crust. According to perpetuated culinary legend, this delicacy originated in a convent in Bordeaux/France in the 17th or 18th century. However, there is absolutely no documented or archeological evidence for this! Yes, there are pastries with a similar name, from that area and period. No, they do not resemble "the" cannelé that we know today. But that it originated in the Bordeaux area is quite likely. It is wine country. Egg whites are a good source of the protein albumin. This protein was - and is - used in "fining" of wine: the process of clarifying and stabilizing the wine. Beaten egg whites gently absorb crud, as well as harsh and bitter tannins, leaving behind softer tannins. The wine makers separated the eggs, used the whites, and donated the yolks to the local nuns who took care of the poor, and used them in pastries. As Bordeaux is a historically important port city, it also was a point of entry into France for rum and vanilla from the colonies. Both are important ingredient of cannelés. Anyway, the cannelé as we know it today, baked in its characteristic fluted molds, did not emerge until the second half of the 1900s. Cannelé is spelled with double "n", which refers to the fluted form of the molds that they are baked in. Canelé with one "n" was trademarked by a bakers association in Bordeaux in 1985. Cannelés come in different sizes. The large ones are about 6 cm (2½ inch) tall and weigh about 60 grams (2+ oz). 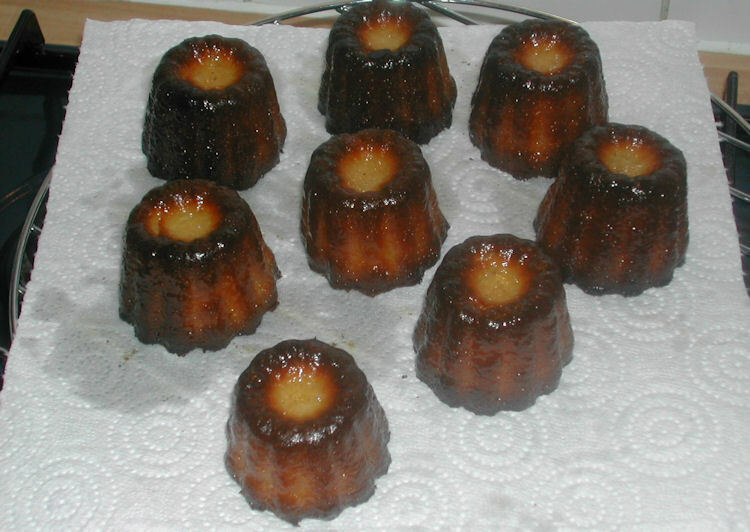 In France, cannelés are sold in special shops, many bakeries, and also in supermarkets. But I have to say, other than in shops such as Baillardran they are not always as good as they could - and should - be... And they are definitely not cheap! Neither are the genuine fluted copper molds: the large ones are sold for 7-10 Euros (a piece, 2015 pricing). Baking them one at a time is not an option. So you have to heavily invest in a set of copper molds, or use a silicone cannelé mold with 8 or more large "cups". Note that the batter is slightly different for the latter molds. The recipe below is for silicone molds. use "fresh" (not dried out) beans, and do not substitute with vanilla extract! This recipe makes enough batter for 16 large cannelés. If you want to make large cannelés, get two "8-hole" molds. Or: get one such mold, and bake in two batches. Silicone molds are floppy/flexible. When filled with batter, they are basically impossible to transfer to the oven without spilling the batter. Beat until well blended - do not over-beat, the batter will become too airy! Remove the beans from the milk. Add the rest of the milk to the batter - make sure you get all the vanilla seeds! - and beat until blended. Again, do not over-beat! Let rest at a cool place (e.g., in the refrigerator) for 24-36 hours! Fill the mold-cups to about 75-80%. Important: with silicone molds, make sure to fill all mold-cups, as un-filled mold-cups may get damaged. Bake at the high temperature for about 5-8 minutes. The batter will rise for about 1-2 minutes, then turn golden on top, begin to bubble and caramelize, and the center of the top will become browned. See photo immediately below. At this point, turn the temperature setting down to 180° C (350° F) and bake for 1 hour. After about 20 minutes, cover the mold with aluminum foil. Enjoy - best when still warm! 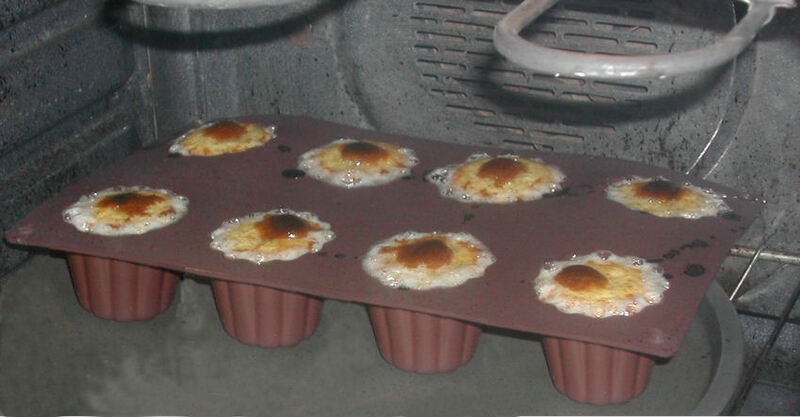 A batch of cannelés, bubbling in my oven. A batch of cannelés, right out of the oven. Serve within several hours of baking - best when still warm! Do not store in a plastic bag or in the refrigerator.